Pacharee Sa-nguanprasert (Pang) was born in April 19, 1990. 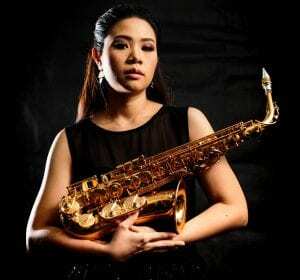 Pacharee started to learn saxophone when she was 14 years old in secondary school band. In 2008 Pachare was accepted from College Of Music, Mahidol University Major in Saxophone performance (Classical) with Professor Shyen Lee and Mr.Anawin Kerdteesud in Jazz Saxophone (Minor program).After graduated she work as teacher and musician. In 2014, She has set the group with her partner “Kwang” which called “12 Tone” channel in Youtube and Facebook Page. As they work together known as “SAXPACKGIRL”, Kwang & Pang did the Travel&MusicFestival Video Program as the hosts. And they did the Cover songs and also write their own original songs to use for the Youtube programs and Live Sessions.